Last July I had the pleasure of embarking on a three week DJ tour of Chile and Brazil, playing almost ten DJ dates in the midst of plane rides, sightseeing, and friend-making. One of the cities I visited for the first time was Curitiba in southern Brazil. It's quite an urban, developed metropolis full of cool architecture and yummy Italian restaurants. It's also the home my buddy Marcelo Medeiros, who runs the Discotheque radio station and record label, and who served as my able tour guide the twenty four hours I spent in his city. 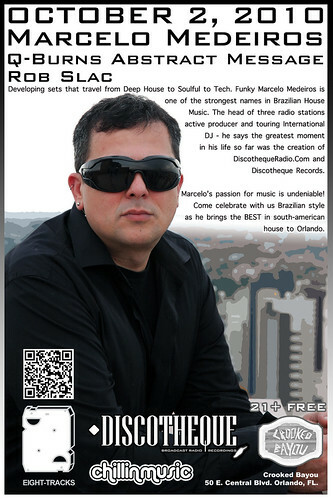 I know Marcelo as I he broadcasts my monthly Invisible Airwaves show on his Discotheque Radio (which transmits worldwide via their web site … check it out - www.discothequeradio.com). It's possible that you remember Marcelo from almost exactly a year ago when we presented our Springtime In Brazil party at Sky60. Marcelo guested and provided an expertly mixed set of deep house and vocal tracks, featuring many producers and tunes from the country of Brazil. This week Marcelo Medeiros has returned to Orlando for a bit of fun, sun, and theme parkin' and thus we're happy once again to host him for another house music shindig. This time we're taking over Crooked Bayou, on this upcoming Saturday night, for a dose of top quality house music, Brazilian and otherwise. I, Mr. Q-Burns Abstract Message, will be joining Marcelo for this evening of tunes as well Rob Slac of Chillin Music. There's no cover, it's 21 and up, and the music will start about 10:00 PM. You can count on great friends, atmosphere, and lovely tunes perfect for dancing or chilling out while enjoying your tater tots and/or stiff drink. This all takes place this Saturday night, October 2, at Crooked Bayou located at 50 East Central Blvd., Orlando, FL 32801, (407) 839-5852. Click HERE for a map or directions. RSVP via our Facebook by clicking HERE. We'll see you on Saturday night! P.S. - Also, if you didn't know already, I'll be joining San Francisco/Montreal DJ Fred Everything and Atnarko at The Peacock Room the night before, Friday, September 1. It will be a great weekend for house music in Orlando!